My Sweetie practices the piano before Carrie's wedding last weekend. This is actually a photomontage on an iPhone photo I made at the wedding venue site, Salvage One. The original was too bright and stark; the warehouse clutter in the background too distracting. I cropped it way, way down to the juice of the shot. 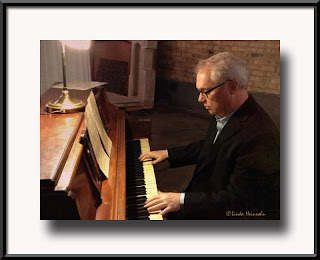 Then I added a watercolor texture image I made years ago, manipulating it until it gave an overall warmth to the photo and toned down the highlight on the top of the piano.